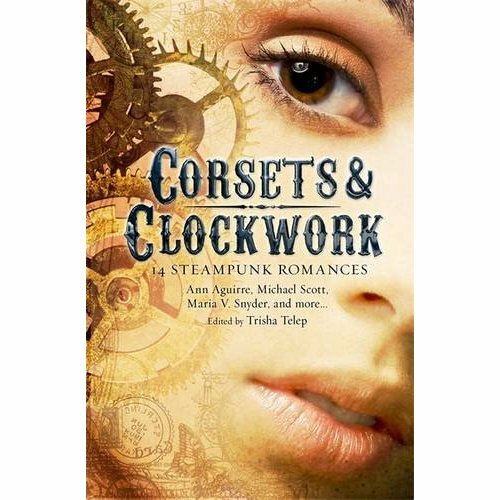 Thanks to Ann Aguirre on Facebook and Tez Miller we have the cover to a new steampunk romance anthology called Corsets & Clockwork. Release date is May 2011. A stunning anthology of the very best of steampunk that's taking teen fiction by storm. Bestselling romance editor Trisha Telep brings an exciting new element to the fast-growing sub-genre of steampunk, which bends and blends the old and the new in increasingly popular dark urban fantasies. Young heroes and heroines battle evil, in various forms with the help of super-technological or supernatural powers, while falling in and out of love. Ann Aguirre a bestselling author who writes urban fantasy (the Corine Solomon series from Roc), romantic science fiction (the Jax series from Ace), apocalyptic paranormal romance (as Ellen Connor, writing with Carrie Lofty, from Penguin), paranormal romantic suspense (as Ava Gray from Berkley), and post-apocalyptic dystopian young adult fiction (Razorland and Wireville coming in 2011 from Feiwel & Friends). Tessa Gratton, her debut novel Blood Magic arrives in 2011 from Random House Children's Books, followed by the companion Crow Magic in 2012. Jaclyn Dolamore is the debut author of Magic Under Glass from Bloomsbury USA. Lesley Livingston is the award-winning author of Wondrous Strange and Darklight, the first two books in the bestselling trilogy from HarperCollins. Caitlin Kittredge is the author of the Iron Codex trilogy, a Lovecraftian steampunk adventure. Dru Pagliassotti’s first novel Clockwork Heart was one of the first in the rising new genre of steampunk romance and was named by Library Journal as one of the five steampunk novels to read in 2009. Dia Reeves is the debut author of the critically acclaimed YA Bleeding Violet. Michael Scott is the Irish-born, New York Times bestselling author of the six part epic fantasy series, The Secrets of the Immortal Nicholas Flamel. Maria V. Snyder is the New York Times bestselling author of the Study series (Poison Study, Magic Study, and Fire Study) about a young woman forced to become a poison taster. Tiffany Trent the author of the acclaimed YA dark fantasy series Hallowmere, which was an IndieBound Children's Pick and a New York Public Library Book of the Teen Age 2008. Kiersten White is the debut author of Paranormalacy, the first book in a new trilogy, which was published by HarperTeen in August of 2010. Adrienne Kress, is the author of Alex and the Ironic Gentleman and Timothy and the Dragon's Gate. Thanks for the heads up - I am a big fan of the stuff Ms Telep edits.. I have yet to read any steampunk. I really should do something about that. Hey Doug, have you read The Iron Duke yet? Jessica I show my age when I say I liked the original Wild Wild West which had so many steampunk elements in it. With the exception of the works of Jules Verne I pretty much discovered steampunk through television and the movies. yllektra a nice balanced design - not too in your face with the steampunk/clockwork stuff that so many of the books have.